Every week we pull together some great recipes from Canadian food bloggers around the web featuring one main ingredient. This week, instead of an ingredient, we're featuring a colour - green! Spring is starting to sproing across Canada and St. Patrick's Day is only a few days away so let's celebrate green with some Canadian recipes. Green always feels so refreshing and with great seasonal ingredients like ramps and asparagus, spring is definitely felt in some of these recipes! But there's also some decadent desserts - after all, mint and chocolate are a classic pairing that can't be ignored! 15 Great Green Recipes for Spring! 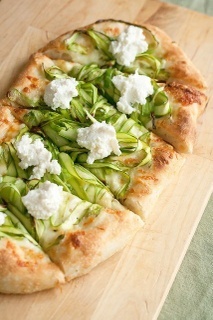 Fresh spring ingredients are what put this Shaved Asparagus Pizza from Isabelle at **Crumb** over the top delicious. Chocolate and mint are perfect partners in this [Chocolate Chip Mint Bundt Cake](http://www.mykitchenlove.com/chocolate-mint-chip-bundt-cake/) from Samantha at **My Kitchen Love**. These ingredients scream spring and green! Try this [Spring Ramp, Radish and Spinach Soup](http://www.simplebites.net/spring-ramp-radish-spinach-soup/) from Aimée at **Simple Bites**. A fun take on sushi with this [St. Patrick's Day Sushi](http://joandsue.blogspot.ca/2012/03/st-patricks-day-sushi.html) from **Jo and Sue**. Double dip your afternoon tea with these delightful C[hocolate Dipped Matcha Shortbread Squares](http://www.teawithmeblog.com/2015/12/matcha-shortbread-squares-dipped-in-chocolate/) from Heather at **Tea With Me**. There are so many ways you can use this refreshing [Coriander (Cilantro) Chutney](http://veganlovlie.com/2015/10/traditional-mauritian-roti-and-fillings-2.html) from Teenuja at **VeganLovlie**. Spice up your guac with these[ Guacamole Jalapeño Poppers](http://kitchenuncorked.com/2015/09/15/guacamole-jalapeno-poppers/) from Natalie at **Kitchen Uncorked**. Take your appetizers to the next level with this elegant [Dill and Goat Cheese Tartine Spread](http://www.cocoabeanthevegetable.com/2015/08/dill-and-goat-cheese-tartine-spread.html) from Hilary at **Cocoa Bean the Vegetable**. Brownies make every day 147.8% better (it's a fact!) so you need a [Mint Chocolate Brownie](http://www.fridaycakenight.com/2016/03/mint-chocolate-brownies/) from Angie at **Friday is Cake Night**. If you're new to the green smoothie trend then you need to give a real boost to the start of your day with this [Green Kale Smoothie](http://www.bhawishkitchen.com/2015/04/green-smoothie-kale-smoothie-detox.html) from Bhawya at **Bhawish's Kitchen**. A favourite in many west coast Asian restaurants, this [Asian Cucumber Salad](https://vanfoodies.com/2014/07/21/recipe-asian-cucumber-salad/) from the team at **VanFoodies** is so easy to make at home! Add some colour to your risotto with kale in this [Kale and Walnut Pesto Risotto](http://foodnouveau.com/recipes/mains/kale-and-walnut-pesto-risotto/) from Marie at **Food Nouveau**. Add some extra heft to your salad with quinoa like this [Green Quinoa Salad](http://www.bakersbeans.ca/the-green-quinoa-salad/) from Wanda at **Bakers Beans**. Fresh, local asparagus is the signal that spring has arrived. Make a [Creamy Asparagus Soup](http://www.flavourandsavour.com/dairy-free-creamy-asparagus-soup/) like this one from Elaine at **Flavour and Savour**. A perfect transitional soup from winter to spring with this [Green Curry Broccoli Soup](http://theprimaldesire.com/green-curry-broccoli-soup/) from Raj and Holley at **The Primal Desire**. Want even more green recipes or St. Patrick's day ideas? Visit our Green recipe board on Pinterest for everything from green doughnuts to basil pesto! A big thank you to all our FBC Members who participated in this weekend's green recipe roundup. Wow! So many great green recipes to try–everything from brownies to sushi! Thanks for including my asparagus soup. Thanks for including our cucumber salad recipe! Wow, that was a pleasant surprise in my inbox this morning. Thanks you two!